It took a long time for plants to develop proper roots and vascular system for land dwelling - tubes or veins to carry water drawn through roots to all parts of their bodies - as well as taller, stiffer bodies that can evolve into ferns and trees. They would evolve ways of reproducing in the absence of water. Like animals, they develop ovaries, producing ova, or eggs, that are fertilized by pollen and develop into embryos within protective bodies. Plants depend on insects for reliable transfers of pollen, while wind, birds, and other animals scatter their fertile seeds. 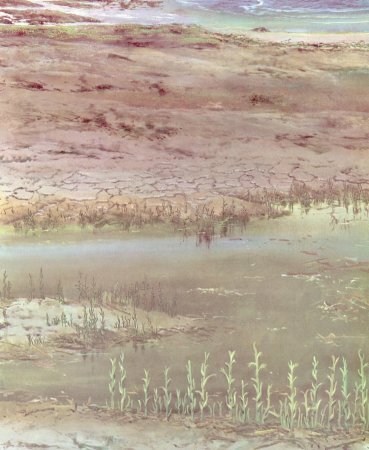 By the Ordovician period, when shallow sea covered large areas of the world, primitive plants such as Boiophyton Pragense had begun to adapt themselves to life on the relatively try land. As shown by Figure 13, Boiophyton had already developed a stiff stem to hold it upright against gravity; equally important, it was vascular - it had developed a system of vessels or tubes to carry water through its body.